Ellie Andrews has been receiving tutoring from Blake McCarthy for three years to help her improve her grades so she can get into one of the top universities to study law. And she’s had a huge crush on him since she can remember. Blake McCarthy is the geek at school that’s had a crush on Ellie since the day he met her. In their final tutoring session, Blake and Ellie finally become brave enough to take the leap of faith. But, life has other plans and rips them apart. Six years later Blake and his best friends Ben and Billy have built a successful internet platform company 3BCubed, while Ellie is a successful and hardworking lawyer specialising in Corporate Law. 3BCubed is being threatened with a devastatingly large plagiarism case and when it lands on their lawyers desk, it’s handed to the new Corporate Lawyer to handle and win. Coincidence or perhaps fate will see Blake and Ellie pushed back together. 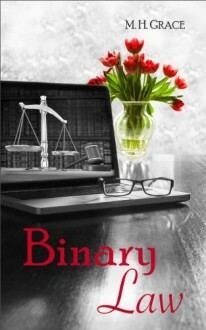 Binary Law will have Blake and Ellie propelled into a life that’s a whirl wind of catastrophic events and situations where every emotion will be touched. Hurt will be experienced, happiness will be presented and love will be evident. But is that enough for Blake and Ellie be able to live out their own happily ever after? “I have no intentions of this journey ending anytime soon, but it starts tonight, with you and me” – Blake McCarthy. I loved this book. I pretty much finished reading this in one setting and it isn’t quite a short read. It all started when Blake McCarthy, crushing over beautiful Ellie Andrews, offered to tutor her in calculus to help her with her grades but mostly to be close to Ellie. Ellie crushing over hot and nerdy Blake accepted his offer and for 3 years they would meet every Thursday. Ellie’s been waiting for Blake to show his interest in her for 3 years!!! She hadn’t need his help in calculus for 8 months but she continued with the tutoring just to be near him. Until that last study session, when Ellie finally kissed Blake…. But Ellie’s dad has been transferred to another military base and they were moving. Ellie promised to keep in touch and to call as soon as they’re settled, but that call never came. Six years later, Coincidence or perhaps fate will see Blake and Ellie pushed back together. This book is light, romantic, antsy and hot! There is none of those irritating unreasonable female lead character. But there definitely is the hot alpha male that we all love. I loved all the main characters here.. I can’t wait to read about Hope and Ben next!! !